As the pace of global change and growth continues to escalate, it’s increasingly recognized that the health of people, animals, and the environment is inextricably linked. A changing environment and the animals and people that share it are experiencing significant health challenges that require integrated solutions and collaborative leadership. That’s the essence of the One Health movement, which unites the efforts of physicians, veterinarians, ecologists, and many other life science professionals in addressing and preventing health threats. Knowing that, take this quick quiz: Which of these veterinarians is engaged in One Health activities? The epidemiology field officer who creates toolkits for detecting and containing the risk of a wildlife disease that can spread to pets and people. The food animal consultant who advises beef producers on how to ensure wholesome and sustainable meat supply. The small animal veterinarian who enables pets to live a long and healthy life. Human populations are growing and expanding into new geographic areas. As a result, more people live in close contact with wild and domestic animals. Close contact provides more opportunities for diseases to pass between animals and people. The earth has experienced changes in climate and land use, such as deforestation and intensive farming practices. Disruptions in environmental conditions and habitats provide new opportunities for diseases to pass to animals. International travel and trade have increased. As a result, diseases can spread quickly across the globe. 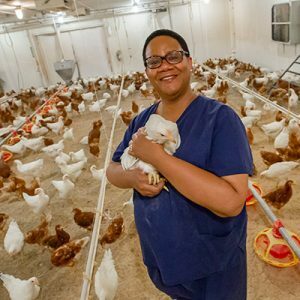 Dr. Yvette Johnson-Walker is a veterinary epidemiologist who leads animal institutions in disaster preparedness training. And she has a soft spot for chickens. 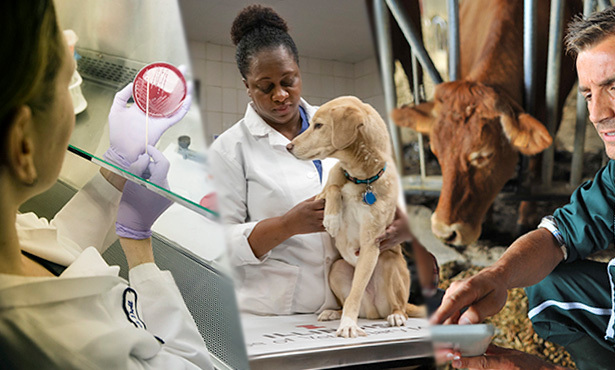 For more than a decade, the Center for One Health Illinois, a program of the University of Illinois College of Veterinary Medicine, has pursued a mission of education, research, and outreach to promote One Health collaborations in the state. Dr. Yvette Johnson-Walker, a faculty member at the college, has been active in the center from the start. “Although it may not be obvious, everything veterinarians do relates to One Health,” she says. Most people know that production animal practitioners—veterinarians who work in dairy, pork, poultry, aquaculture, meat inspection, and many other fields—play a role in public health. “These practitioners maintain food safety by ensuring that medications used to treat the animals are never present in food and by preventing contaminated products from entering the food system,” explains Dr. Johnson-Walker. Small animal clinicians play a role in the health of the pet’s people, in part by keep the pet safe from diseases that could be spread to people, but also by supporting the vital companionship that pets provide. The Center for One Health Illinois works with Illinois veterinary students who enter the college’s DVM-MPH joint degree program. Since 2005, about 50 students have completed both the four-year veterinary degree and, through the School of Public Health at the University of Illinois at Chicago, a master’s in public health degree. Dr. Heather Venkat, who completed the program in 2014, went on to become a career epidemiology field officer with the Centers for Disease Control and Prevention, just one of the many pathways available to veterinarians with this credential. According to Dr. Johnson-Walker, addressing the ways in which humans affect the environment and wildlife also falls under the One Health heading. The College of Veterinary Medicine directly supports activities that assess and protect the health of wildlife species and their environments. Dr. Matt Allender, for example, a faculty member who runs the Wildlife Epidemiology Laboratory, conducts an annual health surveillance of box turtles, which are a sentinel species whose health status may reflect environmental conditions that will impact people and other animals. 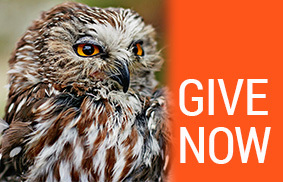 Likewise the Wildlife Medical Clinic not only cares for around 2,000 ill or injured wild animals each year, but also interacts with statewide agencies regarding trends or instances of diseases with public health ramifications. The wildlife clinic celebrated its 40th anniversary in 2018. Based in the Chicago area, the college’s 25-year-old Zoological Pathology Program provides veterinary diagnostic services to zoos and wildlife organizations around the world and participates in Species Survival Programs. So while the One Health Commission, a national organization dedicated to connecting One Health advocates and educating about One Health issues, hosts “One Health Day” each November 3 to raise awareness about planetary health challenges and how to meet them, veterinarians at the College of Veterinary Medicine and around the world are working every day to improve health for people, animals, and the environment.